Cañada freshman Ana Hinojosa hits a backhand in her No. 3 singles win 6-0, 6-1 over Modesto’s Kaitlyn Mayfield in the community college women’s tennis playoffs Tuesday. Dare to dream, Cañada — and dare to dream big. One year ago, the only women’s tennis to be found on the Cañada College campus was in professor Rick Velasquez’s physical education class. 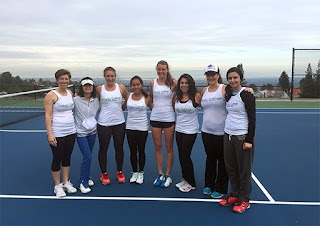 Now, with the Redwood City community college having added an official women’s tennis team to the athletics program this season to fulfill the Title IX requirement, the upstart Lady Colts have been unstoppable. With their second consecutive playoff win Tuesday at Cañada — a 5-3 victory over Modesto Junior College — the No. 2-seed Colts improved their overall record to 17-0. More importantly, they advance to the Northern California championship Saturday to host No. 4 De Anza, as the Owls upset top-seed Fresno City on Tuesday. The eight-player team features an array of generations with ages ranging from 18 to 48, all of one of whom are freshmen. The baby of the team, 18-year-old Joelle Huelse, has fronted the Colts all season as the No. 1-ranked singles player. And the native of Herne, Germany did not disappoint Tuesday, clinching the Nor Cal semifinal win with a commanding 6-1, 6-2 victory over Vanessa Teves. Huelse hadn’t dropped a game until late in the first set. As the freshman dominated by keeping her opponent pinned to the backline with a powerful forehand, the only thing that was able to interrupt her near-flawless performance was when she was distracted by a drone that hovered over the No. 1 court for five minutes to film footage for a Cañada College campus recruitment video. After the drone loudly buzzed away, Huelse continued her march to carrying the Colts to the Nor Cal finals. Being menaced by a drone is nothing compared to the distraction of the previous week. In Cañada’s playoff opener against Chabot College, No. 2 doubles player and No. 3 single Ana Hinojosa missed the doubles play when she was held up at the U.S. customs office at SFO. Returning from spring break in her native Monterrey, Mexico on the same day as the April 5 playoff match, less than a half hour passed between the time Hinojosa departed the airport via Uber to when she set foor on the court for her singles match at Cañada. This week, with no vacations on the itinerary for any of the Cañada players, the Colts were able to return to their regular starting lineup. And Hinojosa was able to settle in with her No. 2 doubles partner sophomore Claire Stoner for a seamless 8-1 win over Kaitlyn Mayfield and Monica Poole. Hinojosa said it was a different experience than the previous week, when she was hurrying the Uber driver to get her to Cañada before the match was over. After Cañada jumped out to a 2-1 win in doubles play — No. 1 Cañada doubles Huelse and Diana Barcelata defeated Teves and Parker Pilati 8-6; and No. 3 Cañada doubles Erin Winn and Joanna Peet fell to Ariel Walsh and Barbara Beasley 6-0, 6-1 — Hinojosa was one of three singles players to take commanding leads to give the team breathing room. Not that having fun is a challenge for the Colts, who freely converse with one another during matches and aren’t timid about complimenting an opponent when one gets the better of them with a good shot. That didn’t stop Hinojosa from ramping up the intensity to take down Mayfield 6-0, 6-1. The freshman’s blazing groundstrokes were hugging the top of the net and giving Mayfield fits. Hinojosa also dominated on serve, scoring two aces amid the penultimate game of the opening set to go up 5-0. She then broke Mayfield’s serve and capped the set with a blazing forehand volley to win it. Stoner wrapped up the No. 4 singles match, defeating Poole 6-1, 6-0. The No. 2 singles match between Barcelata and Pilati did not finish, as the match was still in progress after Cañada clinched the win. No. 5 Cañada single Peet fell 6-1, 6-3 to Walsh. No. 6 Cañada single Mary Nam fell to Beasley 6-0, 6-1. While Peet fell in both her doubles and singles matches, it has been a season to remember for the veteran of the team. Peet — a 1985 graduate of Mills — had never played organized college tennis previous to this season. The only organized sports in which she’s competed since graduating high school are recreation league softball and her serious commitment to bowling through leagues at Bel Mateo Bowl in San Mateo. And, yes, the Colts are daring to dream big. It was Modesto that earned the Nor Cal championship last year. The Pirates squeaked through to the semifinals this year, after a tight win over Santa Rosa Junior College in last week’s playoff opener; the two squads were tied 4-4 when Mayfield won the final match of the day in a three-set thriller to clinch it. Still, having now knocked off the reigning champs, Cañada is looking more and more like a team of destiny.